I'm a little slow: after a couple weeks of running Safari, I randomly poked about in the prefs and noticed a new section mentioning databases. Databases! Does this mean a persistent and offline storage feature like Google Gears in Firefox? Why, yes, it appears to be. Suddenly, the door is open for Safari users to get access to the world of future sweetness which is barreling down the tracks: offline versions of online applications. Google, of course, is moving toward this with offline Google Apps, allowing you to work on your various word processing docs, spreadsheets and whatnot without your computer being on the net. Of course, this spells trouble for the M$ empire, which makes us all happy (unless you are not 'us', but rather, 'them'). Looking around for info on the Safari database, I found this page on the Webkit website, which describes offline database storage being a pre-final Html 5 feature. (Seems goofy to me that programatic access to databases would be part of the Html spec. Ah, well.) 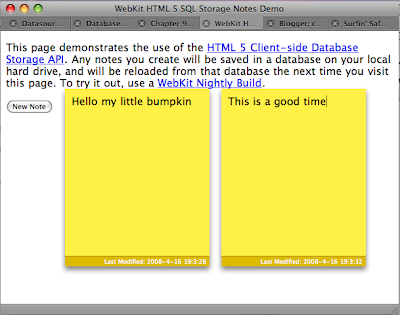 Even better is a simple sticky note demo application which uses the db for storage between visits. Wacky, huh? Access to the db is asynchronous and the data is returned to your application through a callback. 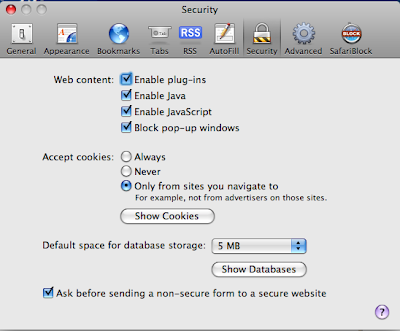 Comments on the webkit site claims that the new functions are secure because each database is unique to a domain, and calls to the database are subject to a single origin policy, just as cookies are. No doubt, funny business will ensue (i.e. don't store credit card numbers, maiden names of any of your mothers, or pet's favorite snacks). 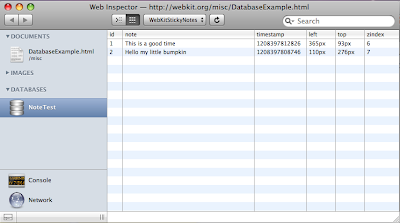 There are GWT bindings for Gears so that you can access the client-side relational database using GWT's Java syntax.